Negative keywords are easy to overlook, but can be critical to finding your target market with PPC. You spend time carefully crafting your keyword list. You write compelling ads that are sure to drive clicks. Your bids and your budgets are spot on. Yet your efforts suffer from low CTR, and the traffic you’re driving just doesn’t seem to convert. Enter the negative. In this article I’ll refresh you on the basics, and take a look at two cases for negative keyword use you may have overlooked, and discuss how to research for keywords during Ad Group or Campaign setup. 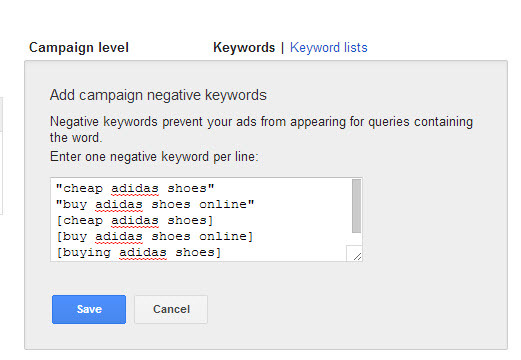 Negative keywords are keywords that tell AdWords not to show your ads for any searches containing that keyword. 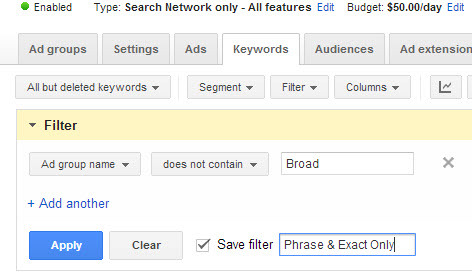 Match type options for negative keywords are: Broad, Phrase, and Exact. Modified Broad negative keywords do not exist, because Broad negative terms work very similarly to Modified Broad match terms. Erin over at PPC Hero wrote a really great piece demonstrating how negative keyword match types work, including a really helpful chart. 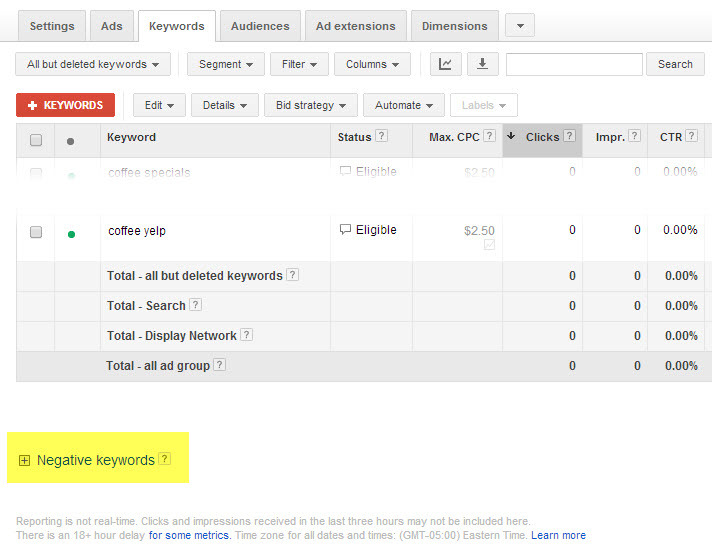 The negative keywords menu lives at the bottom of the keywords tab at all levels of the AdWords interface. Negatives can be set at either the Campaign level, or the Ad Group level. Also, if you’re signed in, and you’ve never worked with negative keywords before, Google will walk you through how to find keywords from your search term reports to add as negatives by clicking on the links labeled “Find negative keywords now” as you see in the screenshot above. 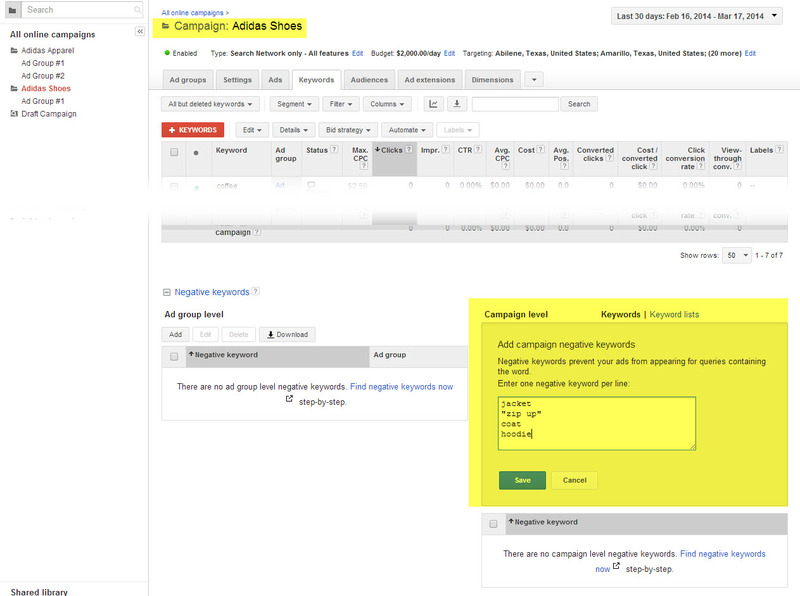 In the Shared Library, you can create lists of keywords to use as negatives on multiple Campaigns. Campaign negatives and Campaign negative lists are incredibly useful if you want to segregate your efforts by a particular brand, product, or intent. For example, if you were a sporting goods retailer that has a Campaign aimed at Adidas shoes, and a separate Campaign for Adidas apparel. Notice that our budget for Apparel is much smaller than our budget for shoes. This could be for a number of reasons, like maybe the customer lifetime value for Apparel customers isn’t as high, so we can’t afford to waste money on clicks that don’t count. One of the challenges we face here lies in the fact that Adidas provides gear for a number of sports, such as running, that has both shoes and apparel. 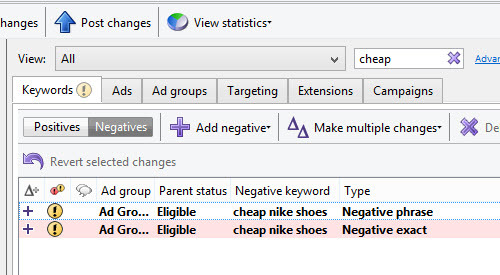 We can help keep these two buckets of keywords separate by adding -shoes & -“running shoes” to our negative keyword list at the Campaign level of our Adidas apparel Campaign. And adding apparel-specific negative terms to our shoes Campaign. It allows us to use very similar general keywords in both Campaigns without worrying about Broad or Modified Broad match terms serving ads for jackets in our shoes Campaign or shoes in our apparel Campaign. 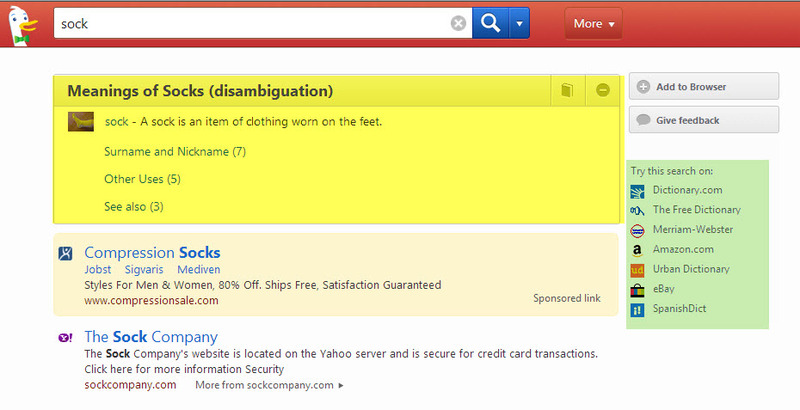 It prevents shoe-related searches from eating up the budget of our apparel Campaign by blocking those terms. 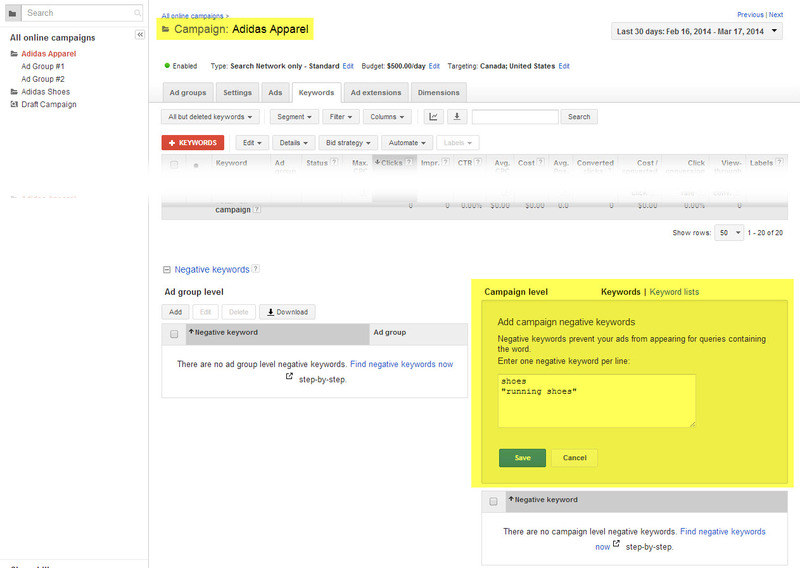 Use Exact match terms you’re bidding on from the shoes Campaign and add them to the Exact match negatives to your apparel Campaign at the Campaign level. You may be able to do this with focused Phrase match terms also, e.g. “adidas running shoes”. 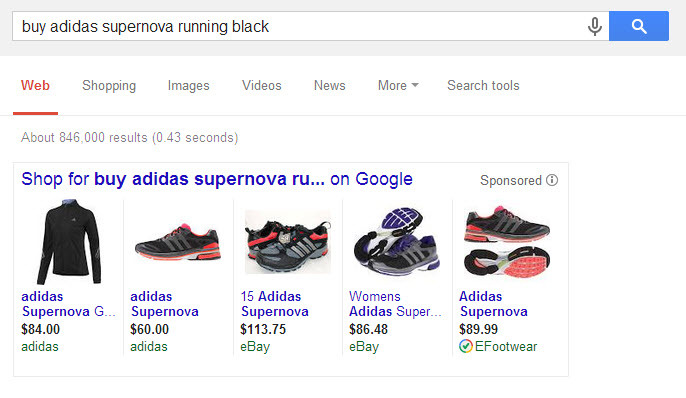 This will help keep your apparel Campaign much more focused on appearing for searches directly related to the product you’re trying to sell. 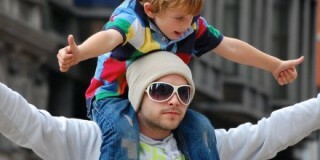 Better focus leads to higher relevancy ads, which leads to more motivated clicks, and ultimately more leads or sales. It will also stop almost all shoe-related searches from matching to your apparel Campaign keywords, which can prevent budget-burning mismatches. A word of caution about this method, though. 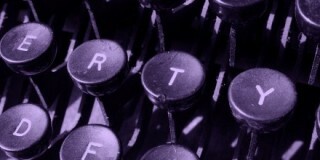 Don’t simply pull your Exact and Phrase match keywords and dump them in at the Campaign level. 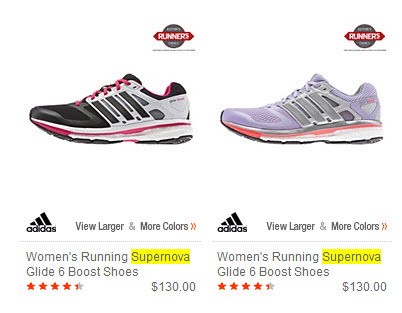 For example, if you had “supernova running gear” in your shoes Campaign originally, you wouldn’t want to place that as a negative in your apparel Campaign. Why? 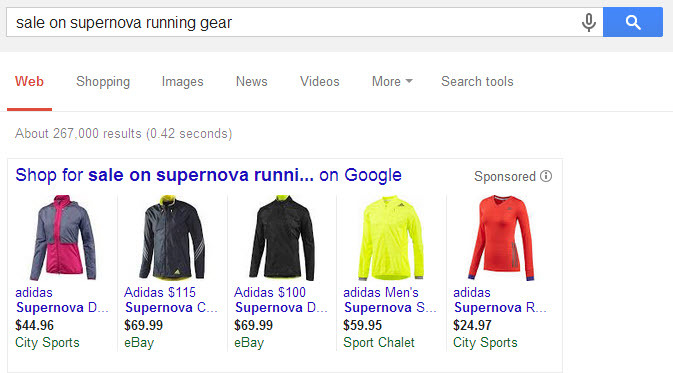 If we excluded that phrase term, ads from our apparel Campaign wouldn’t appear in searches for our example query of sale on supernova running gear. 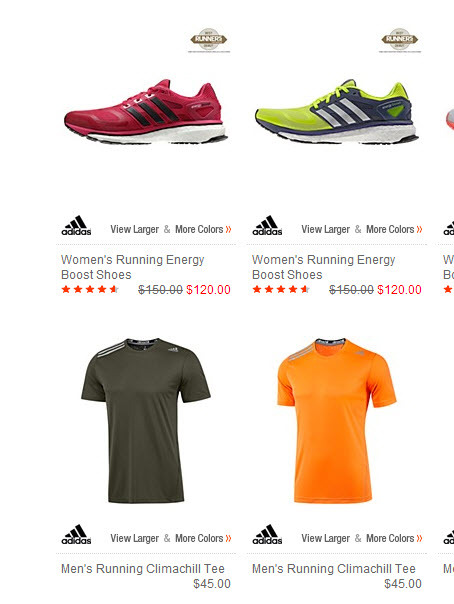 The results here clearly skew towards apparel rather than shoes, which means it would be a mistake to set “supernova running gear” as a negative keyword in our apparel Campaign. 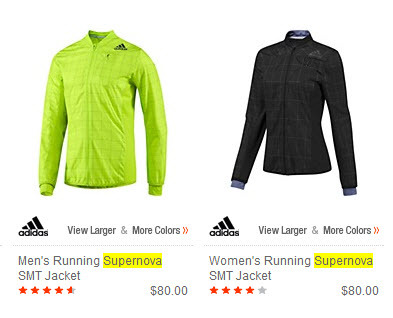 “supernova running gear” should actually be set as a negative on our shoes Campaign, so that our apparel Campaign can handle this keyword. This type of reviewing prevents you from cutting off potential important matches, and can help you discover how to better categorize your bidding terms in the process. If you have massive amounts of keywords and this seems too daunting, try to pick one brand, product, or service to review in this way. This particular use case for negatives is aimed at making sure that your Broad and Modified Broad terms aren’t stealing the thunder from your Exact and Phrase terms. It’s not easy to see, but your match types can conflict with one another, even when they aren’t exact duplicate terms with different matching. Jessica Niver over at PPC Hero does a good job of explaining match type conflicts and provides some guidelines a few ways to approach the issue. Luckily for us, this method employing negative keywords lets your Exact match pull its weight without competition from your other match types, and lets your Broad and Modified Broad match terms keep your reach wide open for those long tail and unusual queries you need to keep growing. Specifically, it prevents the issue of duplication across match types up front by stopping Broad, Modified Broad, and in some cases Phrase match from competing for attention with your Exact match terms by disallowing matches for your Exact match terms. Basically, the pros have to do with gaining focus and control over your keywords and bids. You can more confidently target ads for Exact match ads, knowing that a generic ad you set for your Broad match efforts won’t show up. You can be sure that your Exact & Phrase match terms are capturing all the traffic for that keyword, rather than most of it with the occasional Broad match term getting the traffic instead. It all works to make your bidding and performance tracking much more accurate along match type lines. The cons to this approach are… it’s simply more work. Extra work may not be your cup of tea if you’re already feeling overwhelmed by your workload, but setting this up is a simple routine that will save you money in better bid control and time in reporting in the long run. The method for setting this up is simple: split your keywords into groups by match types, then set your Exact and Phrase terms as Exact match and Phrase match negatives in your Broad or Modified Broad match Campaigns. Clear as mud, right? Let’s walk through the steps. 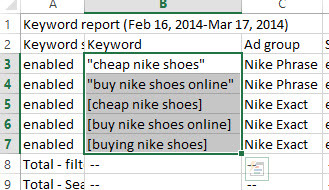 When you have a set of keywords that share a central theme, such as “buy Nike shoes” and have Modified Broad, Phrase, and Exact match keywords, split them out into separate groups by their match types. Keep Broad and Modified Broad match terms together, with Phrase and Exact each in their own groups. 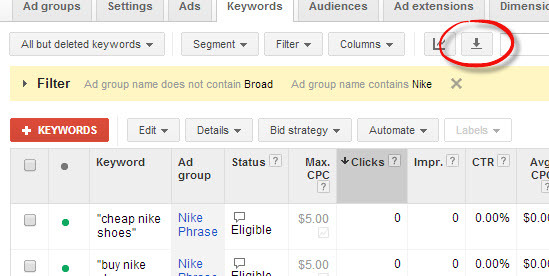 Be sure to name your Ad Groups with their match types. This will become an important filtering key in the future. Since all three groups share targeting goals, they can also share ads. 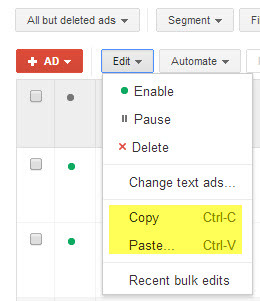 This will allow you to use the copy and paste function found in either AdWords Editor or AdWords to rapidly duplicate new ads as you create them or test them. 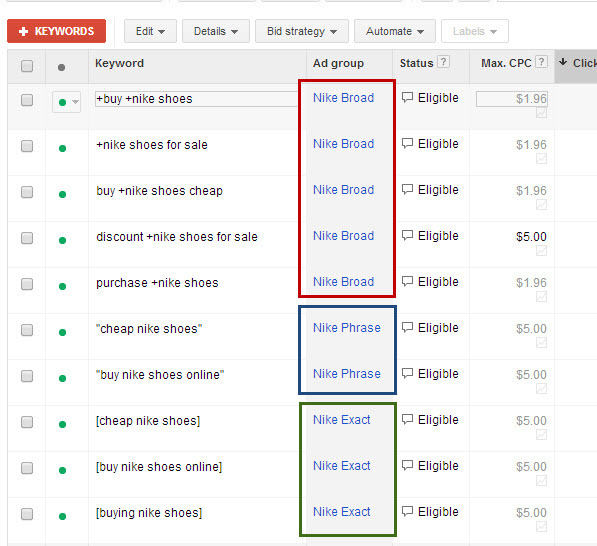 Create a filter within the Keywords tab to show only the Phrase and Exact match keywords. If you have many different Ad Groups covering many different topics, expand your filter to include the term your Ad Groups all share. Once you’ve got your keyword set filtered down to just your Phrase and Exact, download them. This step is needed because we can’t use the Copy and Paste functions of the main AdWords interface with the negatives section. Instead, we’ll use the CSV we downloaded and copy our keywords from a spreadsheet editor such as Excel. Once we’ve copied our Phrase and Exact keywords, it’s time to go back to our Broad match Ad Group and add them as negatives. You can also take your Exact match terms and set them as negatives in your Phrase match Ad Group in the same way, for even greater granularity of control. This step is the maintenance required to keep things running tightly. As you add additional Exact and Phrase match keywords to your Groups, go back and add them to your Broad match negative list as well. This is as simple as copying your Phrase or Exact match keywords after you’re done adding them and pasting them into your Broad match Ad Groups as negatives using the method detailed above. Likewise, if you delete or pause Exact or Phrase terms from your Ad Groups, you have to take them out of your negative list in your Broad match Group if you want to continue to get traffic for those terms. Obviously, if you discover an Exact or Phrase match term is a money sink, you can leave the negative in place. This part can be tedious, because there aren’t filters in the main AdWords interface that can help you search for specific negative keywords. AdWords Editor can help with this issue, however. 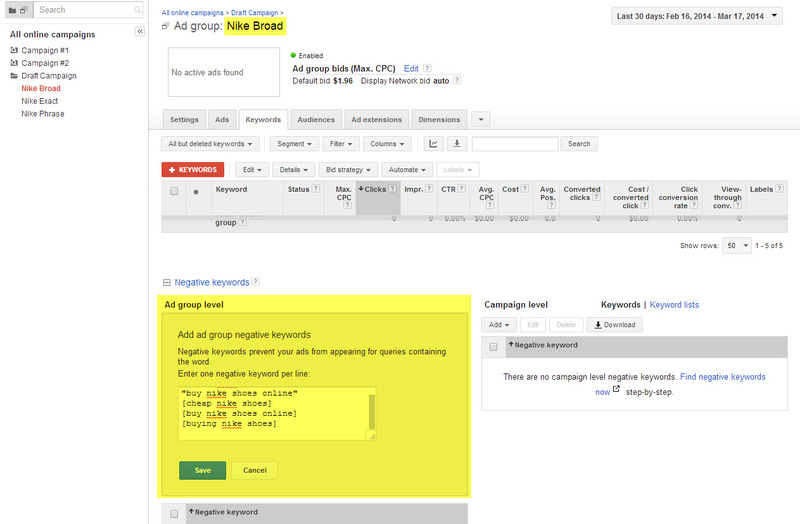 AdWords Editor will allow you to search for specific terms within negative keywords. Editor also allows for some faster copy and paste operations between Groups and positive/negative keyword lists. Editor also provides warnings that show you potential conflicts or issues. Some warnings may be unnecessary, such as the one shown above. In this case, we wanted to exclude both the Exact term [cheap nike shoes] and the Phrase match “cheap nike shoes” so that neither match type was captured by our Broad match keywords. Review your warnings and alerts before making changes, to make sure you aren’t missing any real critical issues. Darian Schouten wrote a great post over at TechWyse called 75 Negative Keywords Every AdWords Campaign Should Include. Read it. This is a great jumping point, providing direct lists of keywords that are highly unlikely to be relevant to many advertisers. However, no list can trump business-focused research when it comes to keywords, positive or negative. In this case, the research we should be doing is looking up common terms in our keyword set to see if there are any negative terms we can put in place before we start up a new Ad Group or Campaign. A great example of a common word that deserves proper negative research is the word diamond. Many different online businesses might use the term “diamond” in their keyword lists. Restaurants with Diamond in the name… the list goes on and on. 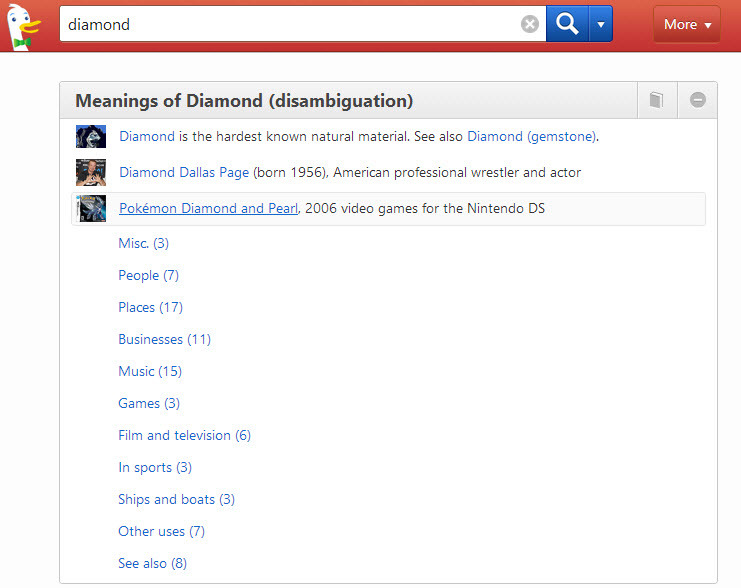 In fact, according to DuckDuckGo, there are at least 86 different uses of the word diamond, and that is only counting disambiguation results. DuckDuckGo is a great search engine in general, and one of the things it does very well is provide definition and disambiguation for as many terms as possible. It also provides direct links to search for your term in other places, which are also context dependent. The area highlighted in yellow is the disambiguation you can use to cherry pick obvious terms to use as negatives, such as names of famous people irrelevant to your product, or highly specific uses of your general term that don’t fit your business model. If your business was selling novelty women’s knee high socks, you might discover through this search that you need to set sock novel, compression socks, and sockpuppet all as negative keywords. Use the “try this search” resources highlighted in green above also. You may discover synonyms that may lead you to more keywords both positive and negative. You might also discover keywords in news stories that you want to set as negatives or positives. Sock full of quarters or a similar term would not be something you’d want your ads running alongside, since it’s likely to have very negative connotations you don’t want to appear alongside. This should be a no-brainer, but searching common terms in Google itself will provide you a wealth of suggestions and possible negatives. …of a Google search results page. Not to mention all the search results in between. a few specific creameries and specialty gift shops. If you made goat cheese outside of the US, most of these results would give you direct terms to add as negatives to your efforts. Anyone making or selling cheese could easily add “cheese drug” and any related drug terms to their negative lists immediately. The other benefit to this research is it gives you an idea of which properties Google values for that very generic, top level term. 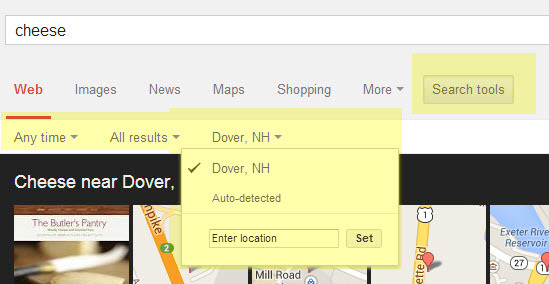 You can also use the Search Tools button above the search results to change your location, the type of results served, or the freshness of the content. This is especially important if you’re already advertising with the Bing and/or Yahoo network. Understanding how a search engine you’re advertising with prioritizes results for common terms can give you a better understanding of how to tailor your efforts for that engine. Bing provides related searches below the search box, and to the right. Much like Google, through the results you can see what Bing values most for the core term “paint”. Bing also has auto-suggest for search, and a few searches indicate that the auto-suggest results from the home page and the search results page may differ. So it could be worth your time to check both. Out of the three methods for searching for alternative meanings and potential mismatches, using DuckDuckGo is probably my favorite. They’re detailed, no-nonsense, and prioritize results as non-commercially as possible, which in turn provides the greatest possible range of potential negative keywords I could ask for as fast as possible. However, you may find that you get the kind of information that’s most relevant to your business’s needs through Google, or Bing. All three have merit, and the end goal of the entire exercise is to find the terms that don’t fit your business goals. Negative terms can improve your signal-to-noise ratio immensely. I’d love to hear more about your experience with negative match. If so, what kinds of negative keyword research do you do? Is there anything related to negative match keywords you’d like to understand better? This is a top-notch post covering various use cases of negative keywords in AdWords. Negative keywords are not just to block irrelevant search traffic, but extremely effective to map a search query to the right keyword. Here, it has been amply demonstrated by using the cross-campaign and cross ad group negative keywords. The list of sources to identify completely irrelevant terms is very useful. I, personally, consider Search Terms Report (earlier known as Search Query Report) to be extremely useful to identify irrelevant terms. A regular (weekly or monthly, depending on the account size), review of search terms report is absolute must. 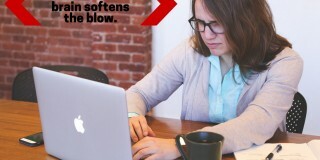 Everyday, Google sees 15% search queries that it has never seen before. To effectively control the quality of traffic hitting your AdWords campaigns, Search Terms Report should be analyzed closely. A side benefit is that you might discover some new keyword opportunities which you can add to your campaigns.